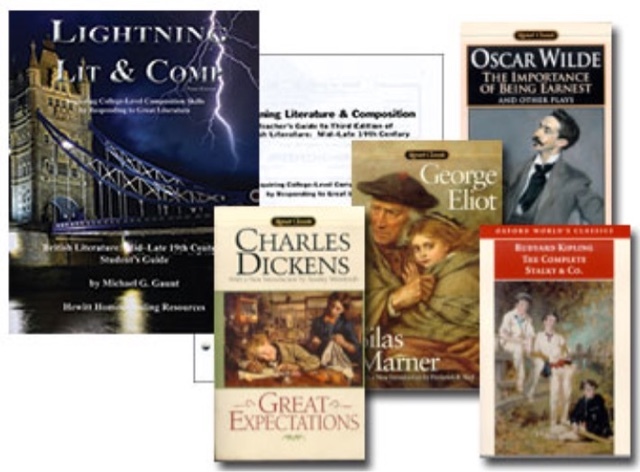 The following is a review of British Literature: Mid-Late 19th Century Lightning Literature & Composition from Hewitt Homeschooling with the TOS Homeschool Review Crew. Designed for 10th - 12th grades, this course fit into our plans perfectly as my daughter wrapped up her junior year and her British Literature and history studies. Lightning Literature for senior high has a weekly schedule instead of a daily one. Lesson plans are provided for eighteen weeks, though some do stretch it to cover a whole year. We had several on our bookshelves already, and I was able to download three as free ebooks. In addition to the books listed, selections by Alfred, Lord Tennyson, Lewis Carrol, and small excerpts by other authors are included printed in the student guide. Quotes from each author are included in the corresponding chapters of the student book. The editor said that he tried to choose books that were important to British Literature and that provide strong examples of good writing. Why and how to read good literature are covered in the beginning of the student book. A good explanation is provided of why to read great literature, with bullet points that are key to the book. It promotes the reading of good literature. Grandparents often help out with our homeschool lessons, and my dad pointed out that the student book has an easy to read print. My mom noted "I believe this book would be very helpful not just to people of many ages. I can even see it as a beginning college text. It covers a lot." It provides a good introduction to some of the masters of literature including Charles Dickens. Every chapter has a large section of study questions. In the study of Great Expectations, the four types of conflict are covered, with specific focus on the conflicts in that book. The lesson covers how every conflict fits into one of these four types: conflicts with nature, conflicts with another character, conflicts with society at large, and internal conflicts. Part of the introduction explains how to read (and break down) poetry. Three works by Alfred, Lord Tennyson pull the student to the time period as they begin to utilize those poetry skills. 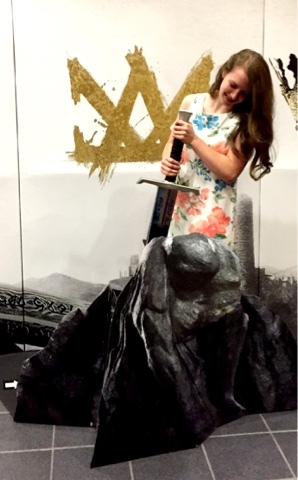 I'm enjoying reading about Excalibur and more with my daughter. More from my daughter: "At the beginning of the book there is a very helpful introduction which addresses questions that you might have about the course. One of the questions asked "Why Read Literature?" What I found very helpful was when the book explained how to read poetry and the different types of poetry. For the lessons that included poetry as the literature it is helpful to go back and look at that guide. The book also includes a schedule which shows how you can complete the Study in a semester or a full-year. Each of the lessons include an introduction. Some of them talk about the author or poets life. I've always found it neat seeing how much of an authors life actually influences what they write. After you read the poem or book for each lesson it asks you several comprehension questions that ensure you remember some of the important topics. I enjoyed reading the quotes written by the authors featured in the lessons. At the very end of the lessons it includes a list of writing exercises. Some of them are challenging but also fun." In summary, my daughter said "it's a good book." Find them on Facebook, Twitter, Pinterest, and Google+, and be sure to tell them hi from Jennifer at A Glimpse of Our Life. Others on the TOS Homeschool Review Crew reviewed so many things from Hewitt Homeschooling; I counted over 17 different products from them on our list. Click the graphic below, you will surely find something that fits your family.